USB Root Hub, not to be confused with physical USB device, is a software driver which allows you to connect multiple USB peripherals to your computer. Most computers have multiple root hubs to share data bus across multiple devices. In Windows Device Manager, you may have more USB root hubs than physical USB ports. The Problem – After restarting computer, the setting automatically changes. 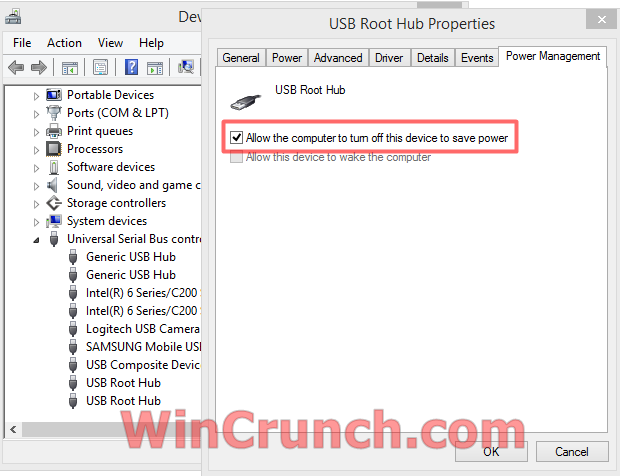 If you disable Allow the computer to turn off this device to save power in Power Management properties of your USB Root Hub, it will come up again next time you restart your computer. This setting will work until you reboot your computer. In simple words, this setting is not permanent, rebooting your computer will enable this option again and you do not want to change setting each time you reboot your computer. This setting can be changed permanently using Windows Power Option. Open up “USB settings”, and open “USB selective suspend setting”, and disable. Next articleWhy does Windows show less than 4GB of RAM? How to find Windows 8 Product Key that is Pre-installed on a laptop?